Last week on Sunday’s “Neeya Naana” program, Gopinath had invited little kids, siblings, with the older sibling on one side and the younger on the other side. The debate was about how one sibling feels about the other and why. Who is favoured by the parents and how the older sibling felt when the younger sibling was born etc. One little boy was quite miffed with the fact that he ended up getting a younger sister when he wanted a younger brother and said all sorts of nasty things to his little sister. I thought he was quite negative at such a young age and was getting uncomfortable with his choice of words and the impact it was having on his little sister. She was about to cry and mind you, both of them are not beyond two feet in height – babies, really. Then Gopinath asked an amazing question, he asked the older siblings that someone wants to adopt their much disliked younger sibling and can he give them away. He asked this little boy who was so negative about ending up with a little sister rather than a little brother…. and he just refused, outright. He was about to cry when Gopinath told him that why not get rid of the little sister when he had the chance. The little boy not only refused but went and got his little sister to his side immediately, and got all protective. The same thing got repeated with all the older siblings refusing to give up on their younger siblings about whom they had several complaints. I was crying, Krishnan was crying and mom was crying seeing that innate kindness and love that these little kids had in their hearts. If only they continued with that heart when they grew up !! But looking around in the adult group, we don’t see that many people who are kind and loving… is there a heart transplant that happens when you enter adulthood ?? Note some of the words she uses – kind, clever, playful, listen …. exactly the qualities we need in the people ruling us. 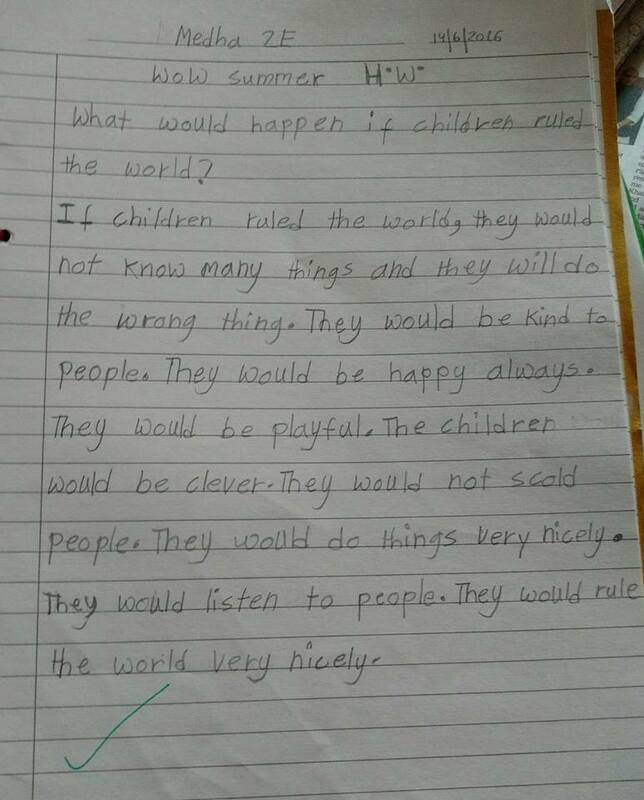 Don’t you feel like asking the children to rule the world? All the governments and the UN can take a leave of absence and let kids below 10 rule the world. We would suddenly have a government that is kind, that listens, thats intelligent (!!!!) and thats playful. Don’t tell me that these children will inherit the world – they will, but by that time, we would have corrupted them. I certainly want to live in a world ruled by children… that world is what I was promised, not this terror filled sick world that I find around me. Please listen, be kind, be intelligent and be playful. Governments around the world – can you start by listening ?? Bindu, I think the little boy who was verbally abusing his little sister, was repeating words that he has seen being used by his parents, other elders at home or whatever he learned from the TV soap operas. Initially kids absorb without really understanding the meaning of the words. As we grow older, the words start taking on a meaning and once people realize that words can hurt, some just dig in and use it more often. Repeated exposure to fights and foul language by parents and others becomes the norm for the child. I wish parents and the media realize the damage they are doing to future generations.